Gillian Evans is a retired professor at University of Cambridge in the field of Medieval Theology. But it was no easy task for her to earn that position. She faced substantial institutional pressure and sexism within her university. She grew up in a working class family – her parents had left school at age 14. But she went on to earn a degree in history at Oxford and a certificate in education, and then a doctorate at Reading University. She was then appointed a lecturer at Bristol University and finally an assistant lecturer at Cambridge. After winning a prestigious research readership from the British Academy in 1986 (there can be up to twenty offered each year, but that year there were only six) and writing thirty-four books (many of these were anthologies, though) and 140 refereed articles, Evans raised the question of a promotion with her University – to a readership or even better a professorship. However, despite her repeated requests, she was denied over and over again. Sexism might have been the proximate cause here – Cambridge has a poor record in promoting women. The facts are these: in 1997, only 13 out of 247 academic staff at Cambridge at the professor rank were women. An independent panel (set up at the demand of an appeals court) resulted in seven outside academics who wrote to the Cambridge’s vice-chancellor, arguing that Evans had “top marks for teaching” and objecting to bias against Evans. Her college voted a recommendation for promotion in 2001, but again, the Cambridge administration turned it down. A 2000 independent audit “found that Cambridge’s predominantly white, male leaders were propagating a macho and intimidating culture and were largely blind to the needs of female, ethnic minority and disabled colleagues.” While women accounted for 14.7% of Cambridge’s academic staff, they were only 6.25% of the professors. 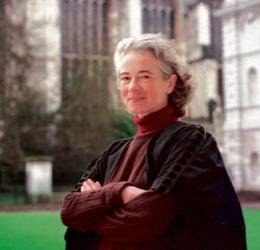 Dr Evans was uncharacteristically coy when she admitted her promotion would "polarise" the academic community – while some hail her as a hero, fighting a David and Goliath-style battle against the establishment, some academics no longer try to disguise their contempt, accusing her of paralysing Cambridge’s governance machine and draining the university’s coffers with her interventions, complaints and legal cases. Her professorship will silence the critics who whispered she was driven only by ego and her inability to accept that she was not of the right academic calibre to join the highest tables at Cambridge. One of the first things she did on hearing the news was to declare that she would now be able to "press on with the battle to get fair treatment for all the university’s staff and students". When she arrived, Dr Evans says the system was entirely based on patronage, with an artificial cap on numbers. After campaigning, the university introduced a set of procedures, which Dr Evans calls "a triumph". She also got the cap lifted, meaning promotion was based on merit. Prior to this competition for professorships often pitched a linguist against an astrophysicist. Dr Evans admits her campaigners used "blackmail" to achieve their aim. They called for a vote to sanction the budget, which effectively paralysed the university as it was unable to sign cheques. She chuckles when she tells this story. Her eventual promotion might have been a case of the squeaky wheel getting the grease, but her academic record certainly exceeded many professors at Cambridge. I recently read The Oxford Illustrated History of the Bible. I was brought up short in the chapter "The Middle Ages to the Reformation", where G. R. Evans writes about the loss of Latin as the language of normal exchange in the West. "It gradually became the language of the ‘learned’ and so the text of scripture and these old sermons could not be understood by ordinary people in parishes. Largely uneducated clergy concentrated on the liturgy, and left out sermons altogether." When did the "ordinary people in parishes" speak Latin? In this country they probably still spoke Anglo-Saxon, with perhaps a little Norman French. If this is the level of Evans’s scholarship, some people may have doubts about voting for her to have a chair. Mr Welbourn returned to the attack yesterday, quoting from critical reviews of some of Dr Evans’s books published in scholarly journals here and in the United States. He said her work had been described as "not deeply perceptive", "flawed" and having "serious shortcomings". Dr Evans brushed aside the criticism and said she stood by what she had written. "In the Middle Ages, people did understand Latin in the pews," she said. "Can you imagine the Oxford University Press publishing it if I was wrong? "Mr Welbourn is an ignorant, spiteful, 86-year-old engineer who knows nothing about medieval history." Dr John Blair, an Oxford University historian who is an expert on the period, said: "There was never a time when more than a minority could understand Latin fluently. There is no way that an average medieval peasant, or even townsperson, could have understood a Latin sermon. There was a lot of preaching in English from the 10th century onwards." On p. 249, Evans describes Johannes Reuchlin as just a friend of the Melanchthon family. He was actually Phillip Melanchthon’s uncle, as Evans correctly states on pp. 264 and 273. On p. 291, Evans incorrectly gives Andreas Bodenstein von Karlstadt’s middle name as Bodenheim. Evans’s treatment of the Diet of Worms on pp. 292-93 is wrong at numerous points. She claims that Luther was summoned to Worms by the Edict of Worms. In fact, the Edict of Worms was the key piece of anti-Luther legislation promulgated at Worms. Before Worms, Aleander (the papal nuncio) and others had engaged in intense legal and procedural debate about how, or even if, an excommunicated man could be summoned to an imperial diet; but the Edict was not the summons to the Diet but rather a decree of the same. This confusion will make classroom discussion of subsequent imperial enforcement of the Edict (crucial in understanding the subsequent shape of Reformation Europe) incomprehensible. On the same page, Evans identifies John Eck at the Diet of Worms with John Eck the scholar with whom Luther and Karlstadt debated at Leipzig in 1519. In Evans’s narrative Worms thus becomes Round Two of an ongoing Ali-Frazier kind of rivalry. In fact, these Ecks are actually two different people. The Eck of the Leipzig debate was Johann Maier von Eck a university scholar; the Eck at Worms was Johann von der Ecken, an employee of the Archbishop of Trier. This is precisely the kind of confusion against which teachers of the Reformation are always warning their students; it does us no favours to have it enshrined in a textbook. On p. 318, Evans’ treatment of the Book of Concord is so superficial as to give no real information or insight into the rather complicated development of post-Luther Lutheranism and, in fact, to be thoroughly misleading. No mention is made of the brutal struggle within Lutheranism between the Philippists and the Gnesio-Lutherans, nor of the role of the two versions of the Augsburg Confession (invariata and variata) in this. The Book is not so much about general Christian unity as it is a sign of the triumph of the Gnesio party within Lutheranism. On p. 319, Evans claims that early English Reformer Thomas Bilney had ‘extreme reforming opinions.’ In fact, while Bilney was undoubtedly a huge influence on a generation of significant English Reformers, he himself was so equivocally and mercurially Protestant in his thinking that even John Foxe shows some embarrassment about his theology in his account of Bilney’s life and martyrdom in Acts and Monuments. On p. 334, we are told that Zwingli was handing out sausages at the Lenten Fast in 1522. This is unlikely. Zwingli was certainly present at the breaking of the Lenten Fast by the printer, Christoph Froschauer (and his men) in 1522. This event did, indeed, involve the consumption of a sausage but Zwingli’s role in the event seems to have been cautious: he did not eat the sausage and I do not think that there is any evidence he was handing such out. Even if he did, the significance of the event lies in the alliance it demonstrates between Froschauer and the reformist party in the early days of the Zurich Reformation, yet Evans does not mention the printer at all. On these same pages there is also considerable weirdness in the discussion of the role of the Libertines. On p. 344, the impression is given that the Libertines never wanted Calvin to return; this is not the case. Some of those Calvin later labeled as ‘Libertines’ were among those who were most keen to engineer his return in 1541. Given that this is supposed to be a textbook, it would also have been helpful for Evans to note that ‘Libertine’ was an unfair polemical term used by Calvin to make it look as if the issues between him and his opponents were moral and theological rather than personal and ethnic. Evans failure to highlight the importance of French immigration to Genevan politics and to Calvin’s changing relationship to those he later labels as Libertines is a very serious lacuna here, given that this is supposed to be a textbook. On p. 359, Evans describes the Scottish Book of Discipline of 1560 as reflecting ‘the peculiarly repressive and punitive flavor of Scottish Calvinism.’ No evidence is provided to demonstrate why the provisions of the book were so notably harsh in comparison to other similar documents of the time. No mention is made of the fact that it was never formally ratified by Parliament, or of the function of Reformation theology and polity within the internal political struggles in Scotland at the time. (This is actually a weakness of the entire Reformation section: material factors such as politics, economics and technology play no significant part in Evans’s narrative). On p. 376, Evans is confused over the relationship of Presbyterians, Puritans and Separatists to the vestiarian controversies of the Elizabethan church. This is too complicated for me to untangle here. Suffice it to say that discussions of the respective powers of church and state, and the extent of the Bible’s practical normativity for ecclesiastical practice meant that the issues of polity and vestments had been intertwined from the moment they first arose in the Edwardian reformation twenty years earlier. On p. 415, Evans makes the statement ‘Whitgift did not regard the Calvinists as a threat in the way Richard Bancroft did.’ This is odd. Of course, how one reads this particular statement depends upon how one defines ‘Calvinist’ but, if you take it in its usual theological sense, then Whitgift was himself a thoroughgoing Calvinist and the statement is redundant. He was, after all, the author of the vigorously anti-Pelagian, Calvinist Lambeth Articles which were later embodied in the Irish Articles. What Evans actually appears to mean by ‘Calvinists’ is either ‘Presbyterians’ or, to use the broader category, ‘Puritans’. Unfortunately, given the state of scholarly literature, this is a confusing use of the term. Indeed, Evans uses terms such as Calvinist, Puritan, Presbyterian and Separatist without defining them or connecting to the massive scholarly literature which discusses these concepts. It is, of course, unreasonable to expect the writer of a general history to have acute knowledge of every area upon which she touches, but some knowledge of the contours of current scholarly discussion is surely vital in a textbook. Evans’s failure to grasp how contemporary Reformation scholars use such important terms leads to a most unhelpful and misleading treatment of the Anglicanism of the late sixteenth and seventeenth centuries. This will simply confuse, not enhance, classroom discussion. There are other problems in the book. In addition to the lack of discussion of the material factors as noted above, there are other significant omissions. There is no mention, for example, of the role of eschatological expectation in the late Middle Ages and its influence on the Reformation. Thus, Evans never addresses Savonarola’s life and influence, nor Luther’s attitude to the Jews, both of which connect to this eschatological perspective. There is no discussion of the Geneva Bible, which is odd given the space devoted to the King James Version. One cannot understand why the King James Version was even written without knowing about the Geneva Bible. Further, the later chapters lack any real structure and have a rambling, anecdotal, superficial quality which leads to some strange moments: why, for example, is Samuel Taylor Coleridge quoted on p. 442? Recently, concerns have arisen among some of our readership in response to a review by Carl Trueman, regarding inaccuracies and inconsistencies within certain sections of Gillian R. Evans’s The Roots of the Reformation: Tradition, Emergence and Rupture. Professor Evans’s work is an important and valuable contribution to historical understanding. We strongly affirm the integrity of everyone involved in this project, from the editors to the endorsers, and we also want to express our firm commitment to the scholarly integrity of this project. But the issues Trueman points out clearly do not represent the academic standards we as a publisher hold ourselves to. Unfortunately, these issues were not caught during our standard, thorough review procedures. The presence of such oversights in manuscripts is common in the publishing process, however, especially with large and complex texts. Nonetheless, we as the publisher take full responsibility for them. Therefore, as of the beginning of June, IVP has taken The Roots of the Reformation out of print and will no longer be shipping orders of this edition. Our goal is to publish a carefully revised second edition of the book by the end of August, in time for Fall semester classes. Further, IVP will offer a complimentary copy of the second edition, including free shipping, to everyone who has already purchased the current edition. We hope that this underscores the abiding value of Professor Evans’s book, one that a number of internationally respected scholars have recommended as a masterful investigation of the Reformation’s roots from the early church through the medieval era. Gillian Evans is a retired professor at University of Cambridge in the field of Medieval Theology. She has been widely acknowledged as an expert and her books have been praised by major figures. However, one sometimes wonders whether those praising her have actually read her books, or are rather simply giving her support because of her institutional and confessional affiliations. Was Packer right when he said the book is “the best of its kind currently available?” Are the other options so awful that Evans’ book is, in fact, better? I highly doubt it. The better question is: did Packer read the book? Or, perhaps, is Packer qualified to write an endorsement for a book on the Reformation? Same goes for Timothy George. He said this book is ‘well researched.’ Did George read the book? Is he qualified to make such a claim about the book? […] The only real explanation for their high praise is probably the simplest: they didn’t read the book carefully. […] If you can’t trust J I Packer and Timothy George, then who can you trust? Other bloggers, including Nick Norelli and Esteban Vazquez joined in the chorus. So, what is one to make of endorsements from senior scholars of Reformed Christianity such as J. I. Packer and Timothy George? Are they willing to endorse a book merely based on the church or university affiliations of the author, without actually reading the book carefully? And, if that is the case, what is one to make of the many statements endorsing Evans’s academic production in whole? I mentioned to Dr. Packer that Dr. Grudem wrote in the TNIV and the Gender Neutral Bible Controversy that he had not checked the meaning of the word adelphos in the LSJ lexicon before he drafted the gender guidelines. (at least that was an honest statement on the part of Grudem. It indicates his general modus operandi.) Dr. Packer looked surprised, so I said that I thought he had read the book since he had endorsed it. He expressed quite a bit of surprise at my naïveté. I have not expertise in this area and therefore no input except to say that it was a fascinating glimpse into this area of academia as well as a reminder to not trust jacket endorsements blindly 🙂 Thank you, a very interesting read. Suzanne — thanks for your comment. I am, however, somewhat shocked that J. I. Parker would lend his name to a book without reading it. I’ve written jacket blurbs before, and I felt obligated to read the material first. To the best of my knowledge, that is the practice with most of my colleagues. Susan, thanks for your kind remarks, and allow me to thank you also for your excellent and inspiring blog. I together with my friends were looking at the nice ideas found on your web blog and so quickly I had an awful feeling I never expressed respect to the website owner for those strategies. Those ladies are actually certainly very interested to see all of them and now have extremely been taking advantage of these things. Thanks for simply being simply thoughtful as well as for deciding on this form of fine themes most people are really wanting to be informed on. My honest regret for not expressing gratitude to you earlier. I know that in 2009 Evans took it on herself, for a fee, to offer an “expert opinion” sworn on oath to the High Court in a case where the canonical powers of a Bishop of the Eastern Orthodox Church were in point. It was very obvious that whatever Professor Evans knew about medieval Bishops in the Western Church, her knowledge of the canon law and practice of the Eastern Churches was seriously deficient. As someone who has reviewed one of Prof Evans’ books, I share the concerns of the blogger. I remember distinctly, when I was reading the book – on the problem of authority in the reformation – that I kept on feeling puzzled by the fact that it never seemed to deal adequately with any of the important questions which needed to be answered. It was as if it was written by someone who had a particular skewed, rather personal perspective on the issues, which rarely got to grips with the contemporary reformation issues about which she was supposed to be writing. I also plead guilty to what I think is the implication of the blog – that academics, out of respect for her position, or for her strenuous efforts to combat the real challenge of sexism in universities, pulled their punches when it came to reading or reviewing her books. I could not really bring myself to question her credentials as a reformation historian, as Carl Trueman has so bravely and rightly done, because I could not bring myself to believe that she was really that bad an historical theologian. Many thanks for highlighting this issue in a really effective way.